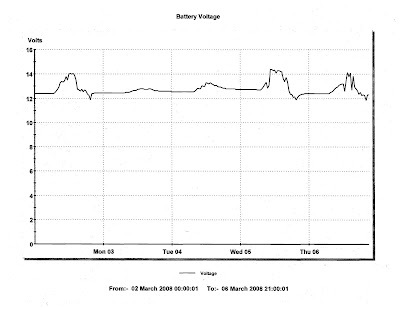 The graph shown below is the result of battery voltage readings taken every 30 minutes for 5 days and nights. Battery voltage increases during the day, even on cloudy days, as a result of charge current from the solar panels. Battery voltage decreases at night, due to the load. These voltage differences can be seen as hills and valleys on the graph. The first day was partly sunny, and battery voltage climbed to about 14 volts. The next two days were overcast, followed by two partly sunny days. Listed below are the highest and lowest battery voltage readings for each of the 5 days. A reading in excess of 14 volts indicates that the batteries were fully charged that day. Fully recharging batteries everyday is the goal, but bad weather interfered with that. A failure to fully recharge the batteries on a regular basis can be considered chronic undercharging, and can damage the batteries. It’s interesting to note that on day 2 and 3, battery voltage did not reach the high voltage threshold. (See my previous two articles for more information about the system automation). As a result the relay did not energize, and the load was not applied to the batteries. The system automation worked well. In this case, it helped to prevent chronic under-charging. The load was applied only after the batteries were fully charged. This occurred on day 1, 3, and 5. Once the relay energizes, it does not deenergize until battery voltage dips below 12 volts. This is seen as three sharp dips on the graph. It is also interesting to note that once the battery voltage dips below 12 volts, and the load is removed, battery voltage rises somewhat. This is a normal battery characteristic. Battery voltage then stabilized at about 12.5 volts, which means that the battery was about 80% charged at that time. Allowing the battery to discharge beyond that will shorten its life.